After the US government shutdown at the end of 2018 / beginning of 2019, the CMVP queue of FIPS 140-2 reports is in better shape than it was after the shutdown of 2013. In the graph above, shorter bars are better than taller bars. The values are from the Modules in Process List after the shutdowns of 2013 and 2018/2019. The blue bars represent the number of FIPS 140-2 reports that need to be reviewed by the CMVP. 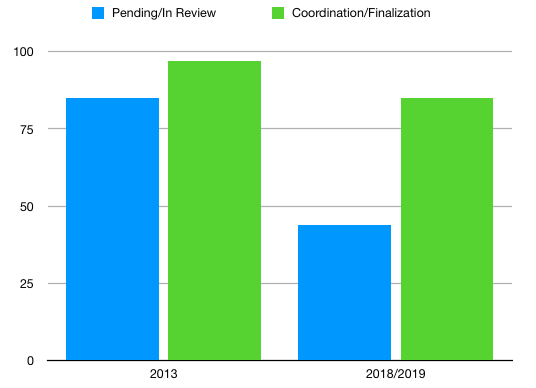 The green bars represent the number of reports reviewed by the CMVP and now require responses from the vendors/consultants/FIPS labs (there’s usually less effort required from the CMVP in the “Coordination” phase). What does this all mean? Back in 2013, I estimated 8 months for the CMVP queue (this is the time it takes for a report to move from “Pending” to “Coordination”). In 2019, I am estimating the current CMVP queue time to be 2-3 months.